Drop down - quick-search filter select of all "weapons" in the game (including summoned/spell equivalents/ shape-shift forms/ ranger pets ) - don't need to add them all at once. And all the class combat damage relevant perks. This would allow you to calculate single target DPS (all graze/all hits & all crits DPS). And then of course you need to be able to compare (multiple) different setups and ability to save load-ups and share them easily (load up the different choices in the URL perhaps) .. This would result in a great off-game character/party planner/builder ..
Edited by peddroelm, 15 April 2017 - 10:12 PM. Hi Maxquest, can you change the speed calculator to allow up to 43 DEX? I believe wood-elf/godlike ciphers can achieve this with deadfire archipelago (+1), wild leech (+10), food buff (+2), rest bonus (+3), prostitute bonus (+2), viettro's boots (+4), skaen's boon (+1), and effigy's resentment (+1) and wanted to play around with a machine gun build by reducing action by 99% and using an arquebus. It may be worth using other firearms and even a priest with minor avatar or a wizard with martial power instead of wild leech due to diminishing returns of action speed decrease from dexterity (due to ~5 frame inter-action delay). Using your calculator would save me from multiple complex calculations. Many thanks for your hard work on it so far: it's a fantastic tool. Increased max DEX up to 43. How come no1 Made (Based on this Data) an Excel calculator for This? Pretty annoying to do it all by hands. Or Can some1 Share His selfmade? Maxquest has shared all the speed calculations, so there is nothing stopping you from making an excel spreadsheet if you would like. Before complaining, look at MaxQuest's signature! He made an excellent webapp. Far better than crappy spreadsheets. Edited by Boeroer, 30 May 2017 - 10:25 PM. so let's say i have 200 frames and 10-20 dmg (average 15); do you count it this way: "my dps is 15/200"? also do we know anything about enemy DRs? Vs 0 DR and assuming that all attacks were resolved as HIT, yes, your auto-attack dps will be 15/200 damage-per-frame, or 450/200 damage-per-second. Vs higher DR (that is not covered by DR penetration) it's more complicated, as at least 20% of (non-lash) damage will always go through. So your average 15 vs 0 DR, becomes 5.327 vs 10 DR.
And it becomes more complicated if we start taking misses, grazes and crits into account, their damage modifiers, and also attack quality conversions: graze-to-hit, hit-to-crit and so on. For the main game, there is this table. For expansions through, there is no list I am aware of. Although you can take a look into in-game bestiary; and unlock the entries if need be via console (iroll20s -> UnlockBestiary). Edited by MaxQuest, 01 June 2017 - 01:31 AM. Just now stumbled upon this thread. SO INCREDIBLY USEFUL! Thank you! Anyone know what 'type' of attack speed the speed bonus from Spelltongues attack speed drain is? After looking around on the attack speed calculator I saw I could get quite fast attack speed with Spelltongue + Dragons Maw while still wearing Vambraces and having Vulnerable Attack (in my quest to give up neither defense, burst damage with HoF, or sustained damage), but that's assuming it stacks multiplicatively with Frenzy and Bloodlust like Gauntlets of Swift Action. The Spelltongue bonus is tricky. When you hit the enemy, you get a Spelltongue Buff, and the target is affected by Spelltongue Debuff. Also since it is a buff, it basically affects both weapons (if you dual-wield), and spellcasting speed as well. There is a problem though, if you durganize your Spelltongue, it will stop applying the Buff completely; and will keep only debuffing the enemy. (see related bug report). Edited by MaxQuest, 29 July 2017 - 02:13 AM. Many thanks for this handy tool. Now let say I wanted to make the stacking rules even more confusing, and modded a modal aura to reduce the armor penalties (random balance suggestions are also welcome). Based on your knowledge, is it going to stack with Armored Grace/DurganSteel/Pilferer's Grip? I think so but can't really spot the small difference in frames in-game. 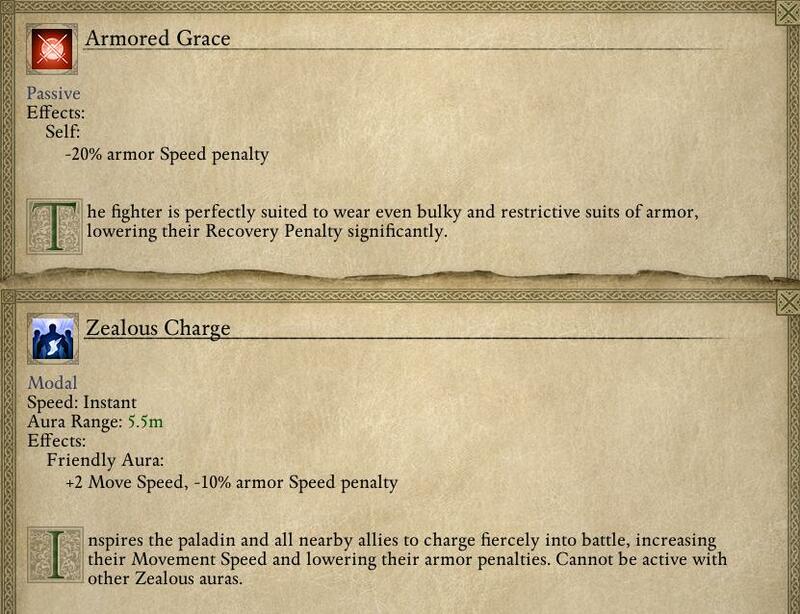 Should I also edit the Armored Grace talent description? It says Recovery Penalty only but Reload is also affected, right? - Mind Wave prone duration was stealhtly nerfed 5s => 3s. Imho it should be 4s. - Mind Wave visual cone originates from caster. Should be from target. - Mind Blades is quite weak in practice: early on there is a high chance to miss/graze which will stop it's propagation. - Make Frenzy instant. It's quite annoying to have to wait for it's animation before using BB/HoF. Not to mention that AI tends to use Frenzy AFTER Barbaric Blow. - Reduce lvl requirement for rogue's Sap from 11 -> 7 or 9. - Buff Dirty Fighting: 10% -> 15%. This will increase the extra crit chance from 5% to 7.5%. - Hold the Line talent: +1 engagement => +1 engagement and +1 to endurance-to-hp coefficient OR +200 health. Uhh. This -10% armor speed penalty from ZC will definitely stack with Armored Grace (ofc the finaly penalty still won't go below zero). 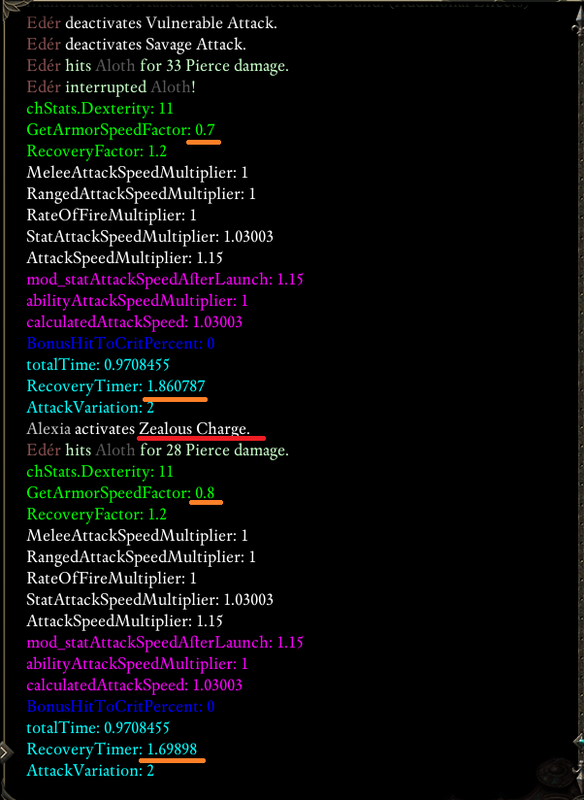 As for stacking with DurganizedArmor enchant / Pilferer's Grip it's hard to say. And it's better to test it. No, Armored Grace does not affect reloading duration in PoE1. It probably will in Deadfire though. Edited by MaxQuest, 18 September 2017 - 02:39 AM. Hah you ninja reply, nice timing. - random suggestions: oh my, I meant about zealot charge only Good ones though, I still have to mod ciphers but I definitely missed frenzy cd and vielo vidorio not working on Paly (really? damn weird) So far I just made her base duration 6->10s, its existence also made me reconsider the first zealous charge implementation of +%AtkSpeed. I'm going through many edits atm, and hate every moment of my UABE career. We're going to get decent modding tools for PoE2 right? RIGHT?!? - I'm going to use your tool, never toyed with frame checkers. - Ok so Armored Grace doesn't work for reload, but the same property applied to modal does? The default ArmorSpeedFactor is 1. Later on the game adds (ArmorSpeedFactor - 1) to the recovery coefficient. P.S. As expected, it stacks with Armored Grace. The question is: will it stack with DurganizedArmor enchant / Pilferer bonus. I wish... but Josh has mentioned extracting the stats and storing them in xml format, so at least that will be much easier to edit. I just hope that if there will still be unity3d assets, they will keep them "small" as in PoE1, and won't aggregate as they did in Tyranny. No. Armor penalties / penalty reductions do not apply to reloading duration in PoE1. Yeah, Pallegina herself does not benefit from the +20% attack speed buff. Also while I was initially fond of this ability, I've quickly found that it gets suppressed by a lot of things and is useful mostly for party rogues, as they don't have frenzy, time parasite, daom spell. Edited by MaxQuest, 18 September 2017 - 03:02 AM. As far as I know armor penalties don't affect reloading, only recovery. So Armored Grace and such can't have any effect here.